If you use Windows’ handy Text to Speech feature with Excel (or any other program), you can modify two different settings: the voice you hear and the speed at which it reads. You can use Windows’ Text to Speech feature to have the computer read text back to you, which comes in very handy when you want to hear a series of cell values read back to you as you visually verify them on a separate printed page. Unfortunately, at the moment, Excel is the only Office application that currently supports this great Text to Speech feature. Choose Start→Control Panel→Ease of Access→Text to Speech. 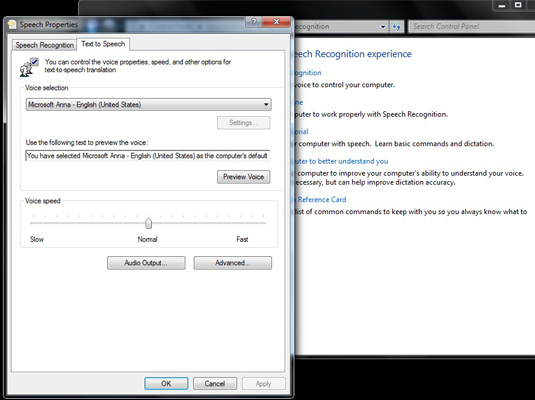 The Speech Properties dialog box appears. Voice Selection: By default, the only digital voice included in Windows 7 is a female voice called Microsoft Anna who speaks American English. However, you can add other digital voices and choose them by selecting one of them from the drop-down menu. Voice Speed: Drag the slider in the Voice Speed area to the left to make the voice slower or to the right to make it faster. Click the Preview Voice button to listen to your changes before you click OK. If you’re using Excel 2007, you first need to add the Speak commands to the Excel Quick Access toolbar before you can use the Windows Text to Speech feature. To use Text to Speech with Excel 2003, display the Text to Speech toolbar (View→Toolbars→Text to Speech).